This post is the first in a series using Uber Movement to measure the impact of critical urban infrastructure closures. Movement includes data averaged and aggregated into zones useful to transportation planners. Such data allows for detailed studies of traffic movement and congestion within cities over both narrow and long time ranges. Following an electrical fire in a subway tunnel, service on the DC Metrorail system was suspended for emergency inspections and repairs for the entirety of Wednesday, March 16th, 2016. Subsequently, WMATA announced the SafeTrack program, with 11 targeted maintenance “surges” in 2016 causing localized delays or shutdowns for up to a few weeks at a time. Since Metrorail served around 700,000 average weekday riders in 2015, such service disruptions were expected to lead to widespread effects across the DC region’s transportation networks. How can we better measure the impacts when critical urban infrastructure like Metrorail is disrupted? 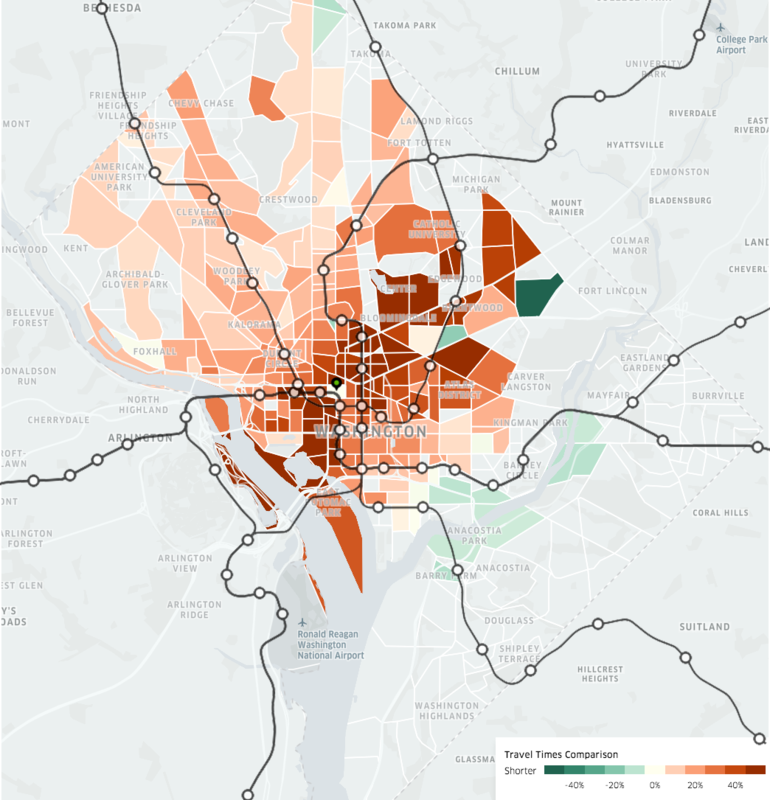 In this post, we present two illustrative examples of how publicly available data in Movement can be used to explore the consequences of Metrorail service disruptions on traffic congestion. While congestion was expected to be higher (and travel times consequently longer) across Washington on March 16th, the most pronounced impacts should occur during the morning and evening rush hours when the most people are traveling to or from work. In the map shown, a TAZ is only colored in if sufficient data exist to provide robust estimates and protect driver and rider privacy. Travel times from downtown were about 20 minutes to Anacostia, and in excess of 33 minutes to Chevy Chase and Brookland. In the Movement interface, we selected one high-traffic TAZ in downtown DC (near the intersection of 13th St. and New York Ave. NW) as the point of origin, and returned all travel times between this zone and the rest of DC between 4–7PM on March 16. The map of travel times is shown at left, with Metrorail lines overlaid for reference. To better visualize how abnormal these travel times are, the map below shows the same data compared to the average weekday in the first half of 2016. Red colors denote longer travel times to a TAZ, while green denotes shorter times. With Metrorail out of service, the vast majority of the city experienced longer travel times (10–30% higher than typical); however, some interesting patterns emerge. Most striking is a band of very long travel times (over 50% longer than usual) extending from northeast of the selected TAZ to the southwest. The ends of this band appear to roughly coincide with the entry points of several major highways into DC, including Interstates 66 and 395 on the Virginia side, and Rhode Island and New York Ave from Maryland. Commuters to Northern Virginia and Prince George’s County may be more concentrated along these thoroughfares, leading to far worse congestion during the service outage. Conversely, the relatively mild congestion through Northwest DC could be a result of commuters in that area and Montgomery County following a more diffuse set of routes out of the District. Interestingly, travel times between downtown and Navy Yard/Anacostia appear largely normal during the shutdown. Movement data can also highlight the effects of more localized disruptions, like those experienced during SafeTrack. During Surge #2 (June 18-July 3, 2016), service was suspended between the Eastern Market and Minnesota Ave/Benning Rd stations on the blue, orange, and silver lines. To look at the impact of this suspension, here we look at weekday travel times from downtown between 4–7pm, compared to the average for mid-2016. Longer travel times are clearly visible east of downtown, largely bounded by New York Ave NE and Pennsylvania Ave SE. On the other hand, unlike the March 16th shutdown, congestion from downtown into Northern Virginia appears minimal. The Metrorail outage on March 16th increased congestion citywide during the evening commute hours, with the worst effects seemingly concentrated along major thoroughfares out of DC into Northern Virginia and Prince George’s County. On the other hand, SafeTrack Surge #2 appeared to cause more localized congestion in the region served by the affected line. Together, both examples highlight the critical importance of Metrorail to the District’s and the metro region’s over transportation infrastructure. When rail transit was shut down, travel times increased dramatically across the district. Originally published at movement.uber.com on January 5, 2017.